Many thanks to everyone for your walnut suggestions. They worked great! Here's the final result, with a tutorial if you'd like to make your own. These golden necklaces are to be the gifts left by St. Nicholas after he visits my son's classroom and collects the hay and carrots the children have left for his white horse. They're really pretty and very easy to make (although it does take a bit of time), so I've written up a tutorial. These would make wonderful gifts if you need to make something small for everyone in the class, or as birthday party favors. 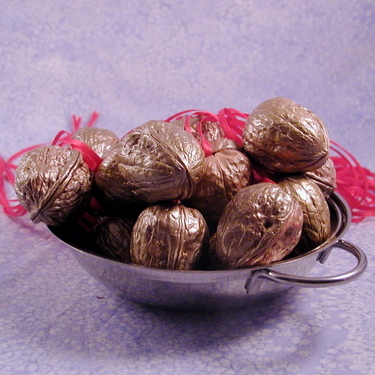 Or, they could be special presents left by St. Nicholas. I'm going to put this up top since it's important not to miss it. 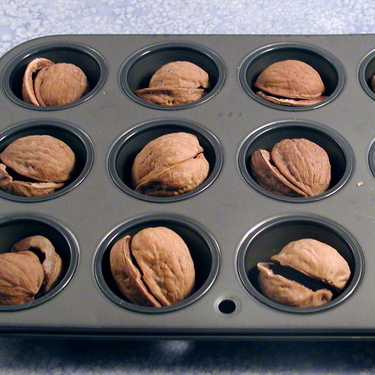 You need to keep your walnut halves together, so after each successful walnut shucking, put the two halves together into one slot in a mini (or maxi) muffin pan or an ice cube tray. You don't want them to get mixed up, if you do, you have a nice what-matches-what puzzle on your hands. If your walnuts are old, you're good to go. I had some that were about a year old, they worked wonderfully. I'm not exactly sure how old is old enough, so you could try a few and decide whether you need to artifically age your walnuts first. Insert a knife or awl or other pointed instrument (I used a letter opener) into the eye at the top and twist gently. The walnut should begin to crack along the side seams. 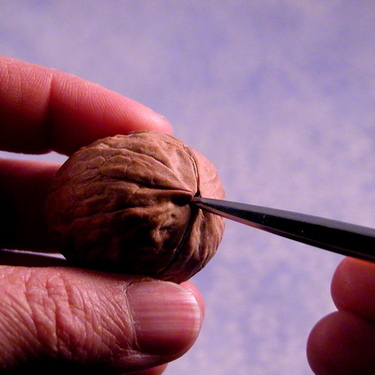 Don't try to pop your walnut apart all at once (although my year-old walnuts happily did this), instead work the knife down along a side seam and twist a little bit, keep going around until the two halves are separated. If your two halves separate along the side seams, you're good. 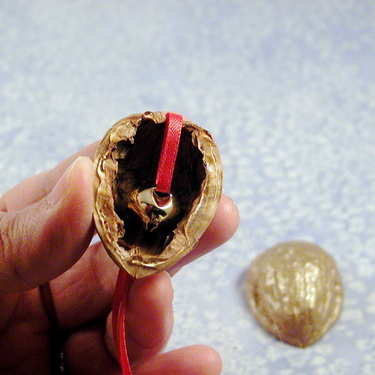 If the break instead randomly climbs around the middle of the shell (and does this repeatedly for a few more attempts), then you need to age your walnuts. To age your walnuts, heat your oven to 225F, put the walnuts on a cookie sheet and bake them for about an hour. Take them out of the oven, let them cool, then try to open them again. They should be much easier to open this time. Still the success rate isn't 100%, something like 50-75% is more reasonable. That's why you started with extra walnuts. As you open each walnut, scrape out the meat and any other fibrous matter from the inside of the walnt and then remember to put the two halves together into a muffin tin slot. 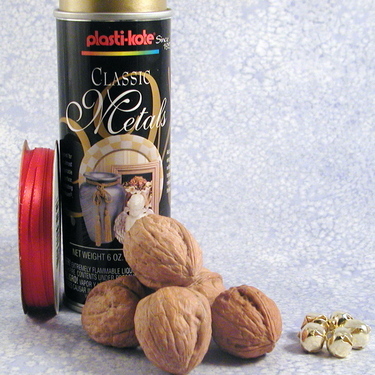 Lay paper outside, put your walnut shell halves onto the paper (in such a way that you'll remember which half goes with which half), and then spray them according to the directions on your spray paint can. I gave mine a light initial coat (the brand printing was still a bit visible through it), waited half an hour, then spray painted again. 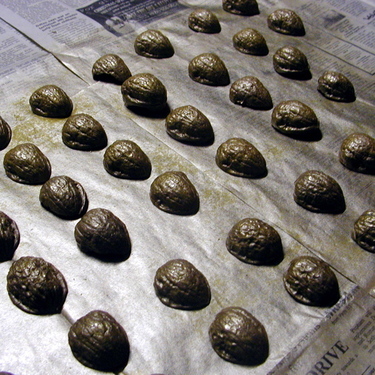 Let walnuts dry (see spray paint for how long). I let mine dry for 24 hours. Cut red ribbon to an appropriate length for your child. I used 30-inch long pieces for 6-year-olds. Thread the ribbon through the bell, tie off the ends (or you can do a double fisherman to make the ribbon length adjustable). Heat up your glue gun and get everything ready, this part goes fast. Take two walnut halves and test fit them together so you'll know if there are any issues (like "I need to turn it this way to get the two halves to line up right"). Keep one in your left hand (for righties) and put the other half down (I found that round-side up worked best for me). 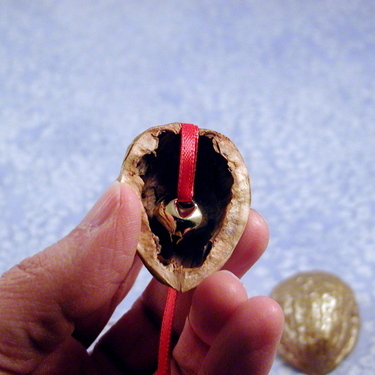 Take one bell-on-a-ribbon, but the bell inside the walnut shell, and lay the ribbon so it drapes to the outside of the walnut, over the eye. Now, here's the quick part. Pipe glue around the edge of the walnut with the glue gun, then quickly pick up the other shell half and fit it together. Maybe it was the glue I was using, or the temperature of the house, but I found that I had very little time to do this before the glue would harden. And I certainly didn't have time to reposition the walnut halves once they were stuck together. Now you're done! String around the neck of your favorite child, or leave out as a present from St. Nick. I hope someone can help me! 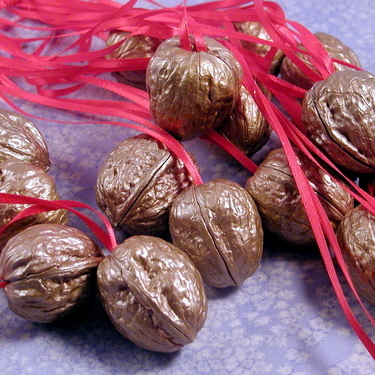 I need to open about 15 walnuts and keep the shells intact so they can be used for craft projects. So far, S and I have tried about 15, with only 1 being possibly salvagable if I glue the pieces back together. 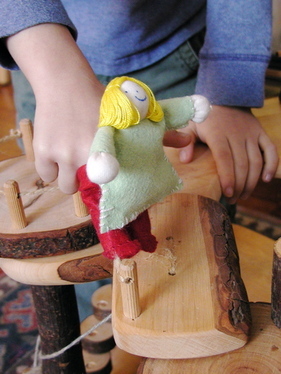 We've tried the squeezy thing, going up and down the side seams. He's tried scoring the side seams with a knife; tapping with a hammer, prying apart from the top. I'm beginning to think that we have particularly fragile walnuts, or else we just don't know the secret! I need to open these then spray paint them, stick a bell on a string inside, and hot glue them back together. By Monday. At this rate, we're going to be knee-deep in failed walnut residue for a long time! Can anyone give suggestions for what to try? Thanks a bunch!!! Two days from today, Max's school will have their yearly Winter Faire. We're so excited! I'm the chair of the Magical Cookie Forest, where trees magically sprout cookies for children to gather and bring home. We've got the trees ready to be delivered tomorrow, about 500 cookies (made by dedicated parents who I managed to cajole) scheduled to be delivered, and many eager children ready to descend on the school grounds. We will transform a small room into the cookie forest, complete with real trees and delicious cookies. The room doesn't have a door, so I thought it would be nice to create a curtain to hang in the doorway, to maintain the magic of the event. 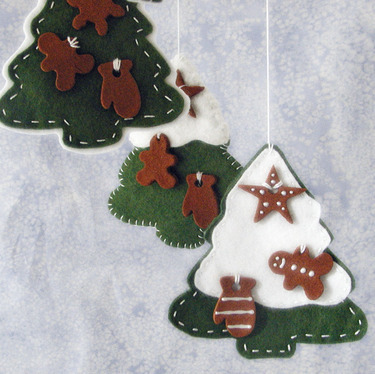 Rather than hang a plain curtain, I made these little felt cookie trees. They'll be tied to the curtain, and after Winter Faire will make an appearance on our tree too! 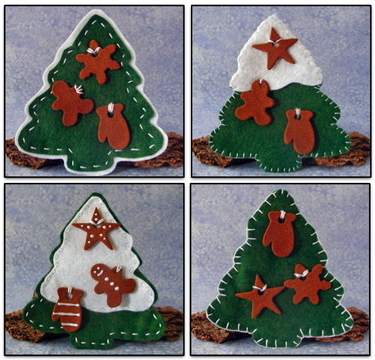 These are so quick and easy to make, I thought I'd give an overview, as there's plenty of time before the holidays to make up some wonderful-smelling cookies trees of your own! 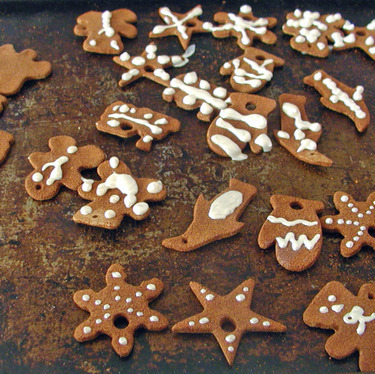 Step 1: Make the cinnamon ornaments. I used the recipe here, recipe #3 with cloves and nutmeg. Mmmm, the smell is wonderful! I baked them in a 200F oven for about 2 hours to dry them quickly. This led to some of them curling up a bit, but that's ok. Then I sanded the rough edges with a nail file. Step 2: Decorate ornaments, if desired. I used white puffy fabric paint in a little squeeze bottle. Very simple. Max got into it too. 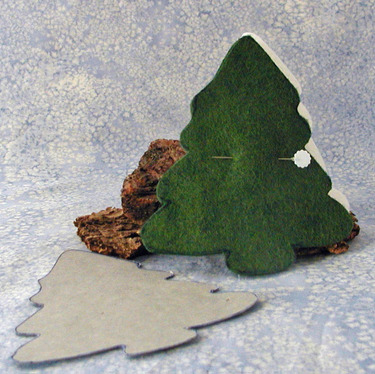 Step 3: Cut out felt, 2 green trees and 1 white. The white can be a partial tree, as it's supposed to be the snow on the tree. For the templates, I simplified one from the Dec. 2007 MS Living, here's the link to the template, I used the largest tree. I used two green layers to give the tree enough stiffness, you don't want floppy trees! I tried both white felt and cotton batting. I like the feel of the cotton batting better, but it does hold its cinnamon crumbs a bit too well! Step 4: Stack trees together and sew! If you used pen to outline your templates for the cutting line, then flip that piece of felt over so the pen lines don't show. You can put your "snow" in front, or in the middle of the two green pieces, or leave it out entirely. 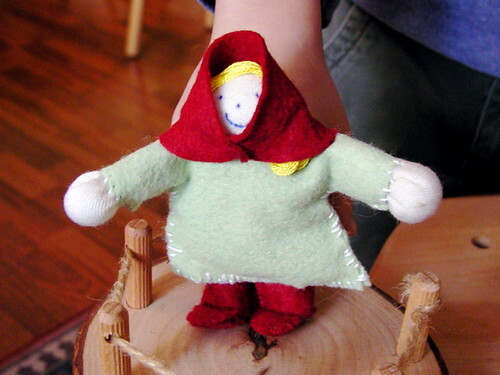 Do a blanket stitch or running stitch around the edges. Step 5: Sew on ornaments once they've completely dried. Thread a needle with thick floss and sew through the tops to make a hanger. You're done!